As a California girl, I grew up going to Disneyland. A trip there could be planned on a whim - the day before even. The prospect of Disney World was daunting. 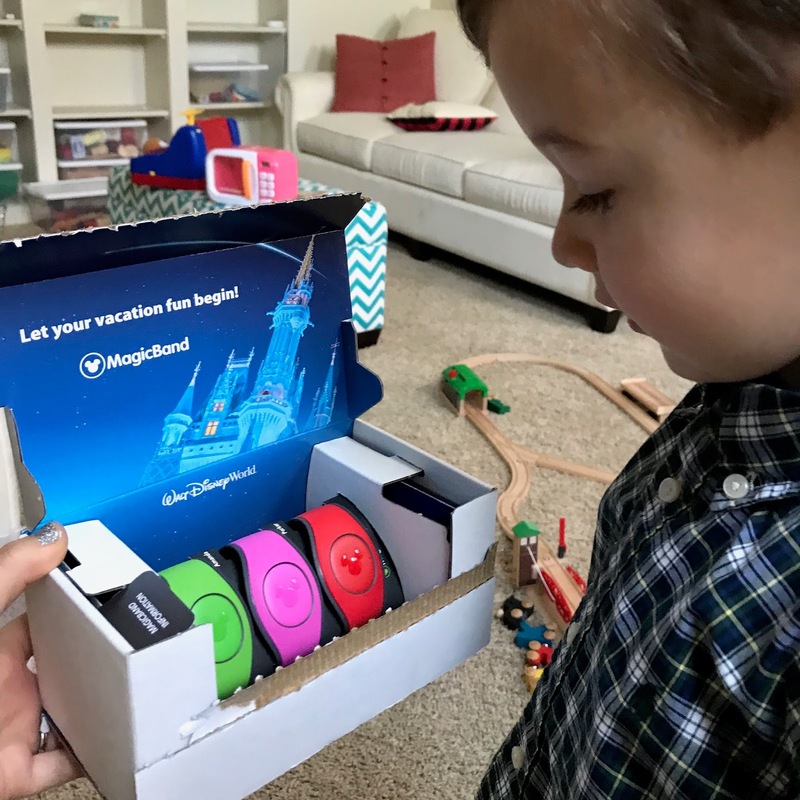 There were so many parks, and hotels, and restaurants, and rules - but when we decided last summer that we wanted to do a family trip to Disney World, I started researching like it was my job. We were five months out from our January trip dates, and I started with choosing a hotel, a dining plan, and the parks we would be visiting. I referred to the blog WDW Prep School for everything from room reviews to meal tips, and decided on The Contemporary Hotel (the very closest to The Magic Kingdom), the mid-level dining plan (the "Disney Dining Plan"), and two days at The Magic Kingdom and one at Epcot. We really wanted to do the Magic Kingdom properly (to us, it was the heart of the trip), and Epcot was so so iconic we couldn't miss it (it ended up having way more rides than I expected, including Test Track which ended up being Parker's favorite of the trip). Reservations for meals at the resorts and parks can be made as far out as six months, but even at five months out I was able to get in everywhere we wanted (Cinderella's Royal Table for dinner, Chef Mickey's for Breakfast, and Be Our Guest for a quick-service brunch). At the time, Parker had only viewed a handful of movies (ever), so over the next several months, we watched Beauty & the Beast, Cinderella, Toy Story, Snow White, and Sleeping Beauty - movies that would introduce him to some of the characters at the rides, attractions and restaurants we wanted to visit. I booked everything directly on the WDW website, and we even purchased our plane tickets through the site. (On a side note, we are super picky with air travel and figured we could get a better price booking independently - but when we compared the costs, Disney gave us airfare that was cheaper than we could get on our own, so we ended up doing everything 100% through them.) At three months out, Disney allows guests staying on site to secure three Fast Passes per park day- best invention ever! This blog post from WDW the Prep School Blog helped immensely in understanding the system as well as which rides were worth a fast pass (I also did a bit of research on Disney's site to determine which rides Parker would be able to ride - at 42", the only one he couldn't ride was Space Mountain). Booking the fast passes at exactly 7am EST, exactly sixty days before our trip, allowed us to snag passes to everything we wanted at Magic Kingdom and Epcot. 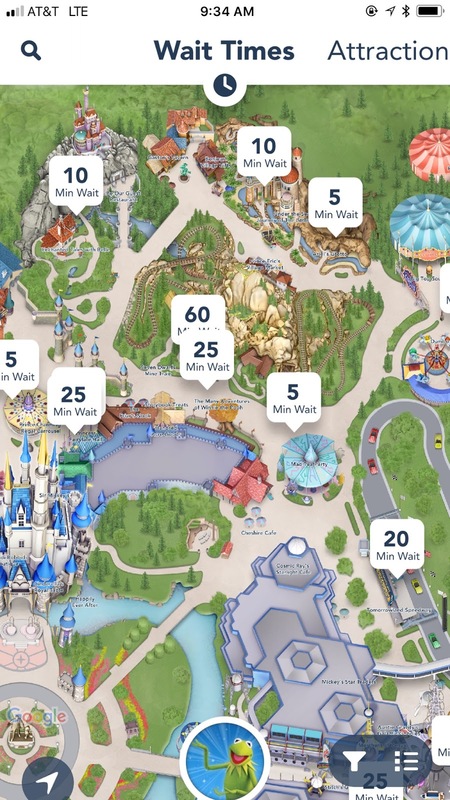 As far as our schedule, Max and I both downloaded the Disney App on our phones, and it gave us our daily reservations, activities and fast passes, as well as real-time wait times for all the rides which was so helpful for maneuvering around the parks. Our magic bands arrived a few weeks before we were set to leave (you can request specific colors via your profile on the WDW website). The magic bands would be worn for our entire trip and they'd serve as our keys for our hotel room, our payment at meals, and our Fast Pass access to rides. They really were magic! 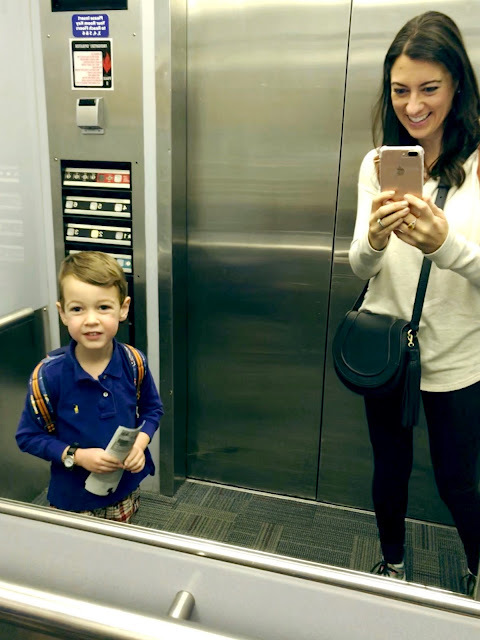 We packed two suitcases (one for Parker, one for Max and me) and checked them at the airport - that was the last time we saw them until they arrived at our hotel room later that day! Just one of the perks of Disney's Magical Express transportation (included in the cost of staying at a Disney resort). Parker was a bundle of excitement, stopping to tell random strangers "We're going to Disney World!" Check out his Mickey pants - courtesy of my local super-talented friend Laura (no, she doesn't have an Etsy shop, but she totally should!). Upon landing in Orlando, we got to bypass baggage claim (since Disney was taking care of our luggage), and use our magic bands for the first time to board the Magical Express bus to our hotel. Though we had to wait a bit for the bus to leave the airport, and stay on while it did drop-offs at two other hotels, we still give the Magical Express two thumbs-up. It was nice to not have to worry about transportation at all (or have to pay for it!). We had the very base level room at The Contemporary (you can upgrade to the Bay Tower for views of the nightly fireworks), but we ended up with a lovely view of Bay Lake (and the nightly electrical water parade!). And remember those suitcases we last saw at the Huntsville airport? They magically appeared in our room later that night! We were at dinner when they arrived, so I'm not sure of the time, but Disney's estimate is that your luggage should arrive about three hours after you do. For dinner that night, we used one of our "Table Service Credits" from our meal plan to dine at The Wave (located in the lobby of The Contemporary). When thinking about Disney food, you really have to adjust your expectations. They are feeding an army, so the dishes are mass produced and you can tell the difference. A $100 meal at Disney is more about paying for Disney and not the food, whereas a $100 meal elsewhere will give you fabulously incredible food, does that make sense? Jumping from there, The Wave was probably one of our most tasty meals of the trip. From our experience, each Table Service meal would amount to about $50 per adult if paying separately (or, one Table Service Credit if using the Dining Plan). Eating on the meal plan let us relax a bit, not having to think about prices while dining (though make no mistake, it was all a big splurge for us). A Table Service Credit will give each adult an alcoholic beverage (holla! ), an entrée, and a dessert. At The Wave, you can swap out a salad for the dessert, so I did the salad and Max did the dessert, and we split both. 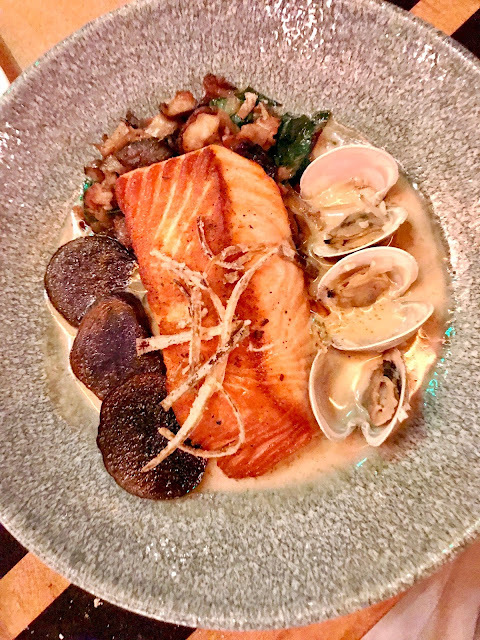 My entrée was the salmon pictured above that had the most delicious seafood broth. Parker ordered salmon as well, but from the kids menu (children must order from the kids menu when using a Table Service Credit). I really appreciated that they had grilled fish as an option (not just Chicken Nuggets or Mac & Cheese, the typical kids menu fare). Parker won big on dessert with a "Make Your Own Sundae" plate - even the sprinkles were Mickey shaped! From there, we stopped by the hotel's quick-service restaurant (Contempo Café) to fill up our complimentary reusable mugs (perks of being on the dining plan) and stock up on milk and yogurt for Parker's breakfast the next morning - because we had a big day ahead! Check back for Disney World, Day One: The Magic Kingdom! Also, see below for some of my must-have items for Disney! That sundae is adorable! What a great start to your trip, thanks to all of your diligent planning! Also, Parker is totally your husband's mini- that airport pic is so precious! Thank you for the advice about the stroller! Olivia will be four when we go and we're thinking we might need one, but I would have never thought to put our name on ours!! Geez! Great idea! The dining plans always intimidate me! I need to look into the one you selected! Yayyyy Disney trip!! I love reading every little detail! Can't wait to read more!